On February 7, 1964, The Beatles arrived at New York’s John F. Kennedy Airport, greeted by scores of screaming, swooning fans who rushed the gate to catch a glimpse of John Lennon, Paul McCartney, George Harrison and Ringo Starr as they took their first steps on American soil. Two nights later, on Sunday, February 9, 73 million viewers in the U.S. and millions more in Canada tuned in to CBS to watch The Beatles make their American television debut on ‘The Ed Sullivan Show.’ In what remains one of the world’s top-viewed television events of all time, The Beatles performed five songs on the live broadcast and ‘Beatlemania,’ already in full, feverish bloom in The Beatles’ native U.K., was unleashed with blissful fervor across America and around the world. The British Invasion had begun. The U.S. albums were originally issued between 1964 and 1970 by Capitol Records, Apple Records, and United Artists in the United States. These new releases seek to replicate the unique listening experience heard by Americans at the time by preserving the sequences, timings, and artwork found on the albums. Capitol’s engineers in the 1960s took great care to produce what they believed to be the best possible sound for the playback equipment in use at that time. Due to the limitations of the record players of the day, engineers often compressed the sound by raising the volume of the softer passages and lowering the volume for the louder parts of the songs. They also reduced the bass frequencies since too much bass could cause the record to skip. In some cases, reverb was added to the tracks to make them sound more “American.” This CD is packaged in a miniature vinyl sleeve that faithfully recreates the original U.S. LP release down to the finest detail, including the inner sleeve. 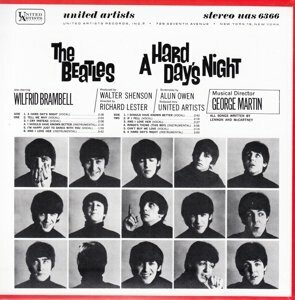 A HARD DAY’S NIGHT (ORIGINAL MOTION PICTURE SOUNDTRACK) was originally released June 26, 1964 in the U.S. It spent fourteen weeks at No. 1. This album is a limited edition release.